A surest route to Employee Of The Month at Warner animation was to develop a new character that might catch on with exhibs and a public. 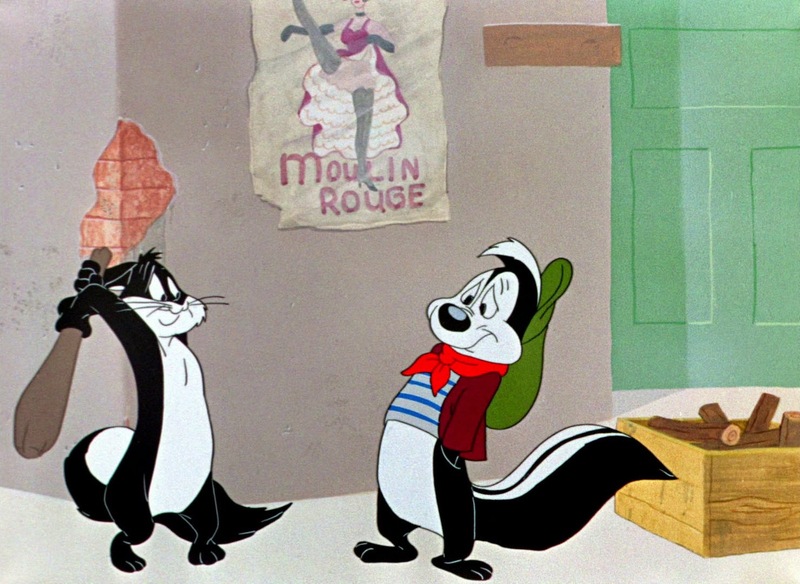 Pepe LePew was such an invention, and I can imagine him as quite the fad before repetition/ennui set in. Like the Road Runner, this was a one-joke affair, but unlike RR with Coyote in pursuit, there was less variation at hand. Essential to all Pepes was his misidentifying a female cat as another skunk and potential mate. With Chuck Jones at ongoing helm, the idea bore fruit despite retelling, but no way could LePew be so frequent and welcome as was Bugs and Daffy. Part of barrier to longevity was his character, Pepe a lover rather than fighter in animated arena where romance was for briefest asides. 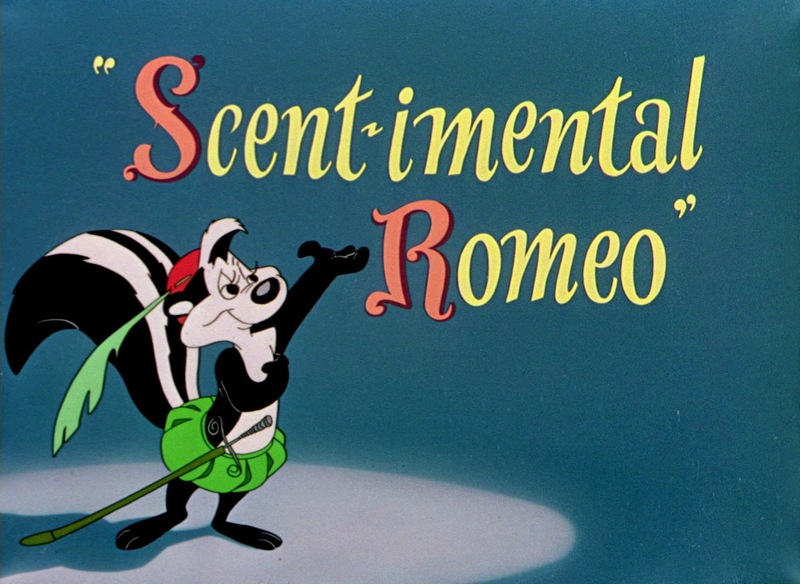 Jones used the skunk as benign foreground to verbal gags, many of them sign-posted along Paris boulevards Pepe inhabits. In no place did Jones' sophistication (appreciated perhaps best by himself) get better airing, the LePews set at same subtle key as Ralph Phillips shorts the director had made. To put it in '52 election context, I'll bet Adlai Stevenson supporters were quietly amused by intellectual flatterer Pepe (and his director), while Eisenhower voters howled at Bugs. Like Adlai, Pepe would eventually lose. Ann Butler and Jay Brennan --- Say Who? I'll not try too hard getting this straight: Jay Brennan began with a male partner who impersonated a woman for their stage act, the latter killed by a bolt of lightning which necessitated replacement by another man as woman, then came Ann Butler to enact, closely as possible, a woman being a man being a woman. Vaudeville history needs scorekeep better than mine for minutia like this. 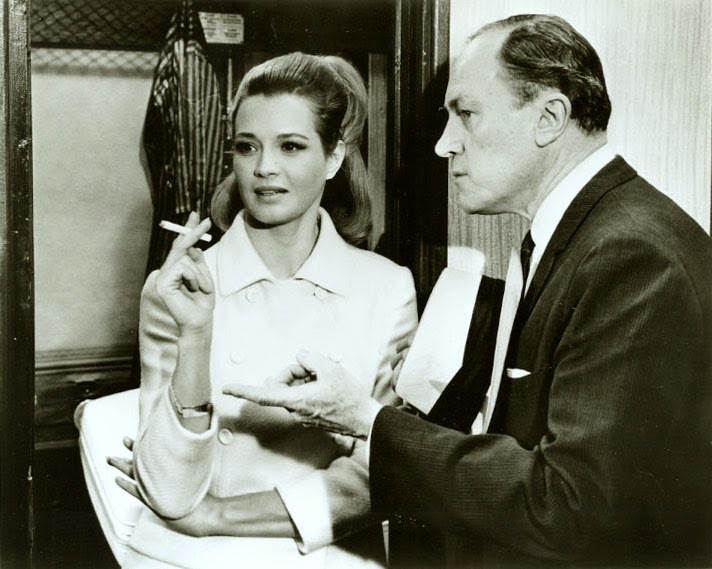 We wouldn't notice or care but for unearthing (by Warner Archive) of curiosities like You Don't Know The Half Of It, which is mostly Butler telling Brennan of odd men she's known (they're odd?). Songs and patter are fun, one's called Can You Imagine A Guy Like That?, and no, we can't. It was important for performers, and their audience, to be hep to slang, more so then than today, I suspect. Easy too for us to get lost amidst torrents of catch-phrasing here, but that's joy of a jazz age as conveyed by entertainers who'd thrive mostly on stage, and leave but a glimpse of themselves on film. I found no more than smatter of credits for Brennan and Butler other than You Don't Know The Half Of It. Like so many others, they laid down the act and faded to obscurity. 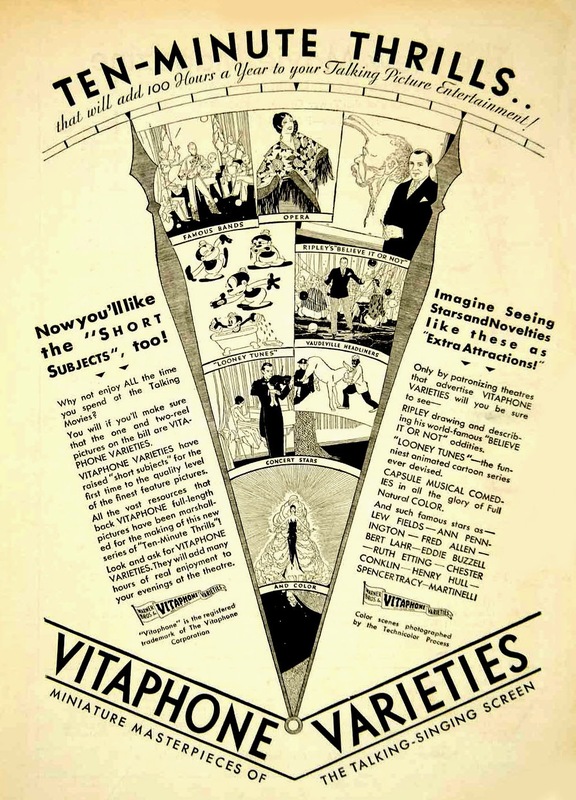 Luckily today there are family members of vaudeville/Vitaphone folk to pursue film and disc that survive, some even bearing costs of mating the media so ancestor's work can be enjoyed again. How to find a most agreeable way to say No? Film companies from inception sat under deluge of unsolicited stories from fan-ship who figured they could write at least as good yarns as those being made into flickers. Enough hours in a nickelodeon might make writers of us all, thought being shared by so many that "I could do better than that." And so a lot of them could ... and did ... upon breaking into pictures from the outside. Surest way of charging gates then as now was coming up with a fresh narrative. It needed savvy, of course, as to how drama unfolds best on the screen. It never was a same art as novels or the stage. One or two reel subjects needed situation more than story. Just put your man/woman in way of danger or conflict and resolve it by ten/twenty minute mark. 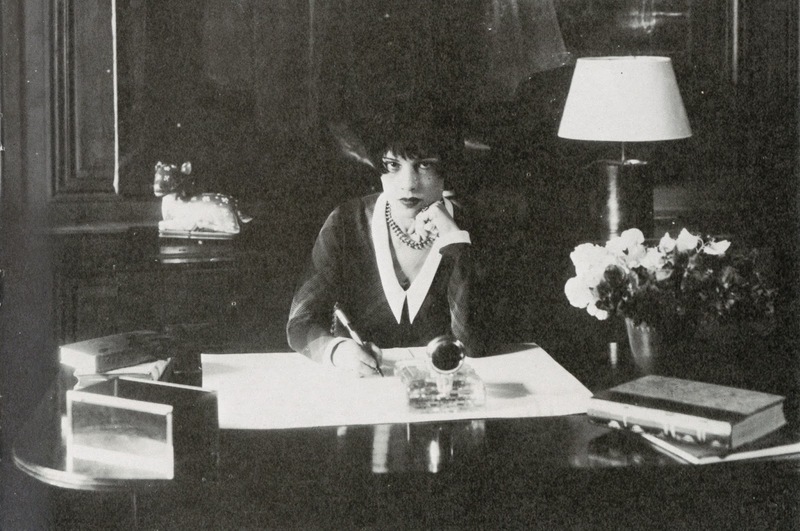 Fast learners like Mack Sennett and Anita Loos cracked the code early and made careers, Sennett starting with pulse-quickeners for Griffith (The Lonedale Operator) and Loos putting humor/heart-tug into The New York Hat, also for DWG. Gee, that seems simple, thought many in the audience, but it wasn't. A coming feature era would further turn checkers into chess. Hollywood developed a "Classical Narrative Style" to make mass production more efficient. Plebes learned quick to plug love, laughs, or action into three acts that one later described as chasing your guy or gal up a tree in the first, throw rocks at him/her for the second, then bring them down in the third. Again --- sounds like a cinch --- but if it were, why so many bad movies? The reject letters here was from a devoted moviegoer's scrapbook circa the early 20's. Judging by bulk of blow-offs, Mr. Douglas F. Weymouth had been submitting tales to the industry for years, and to that I say Bravo, as any writer knows it takes time and endless struggle, even to fail, as most do. 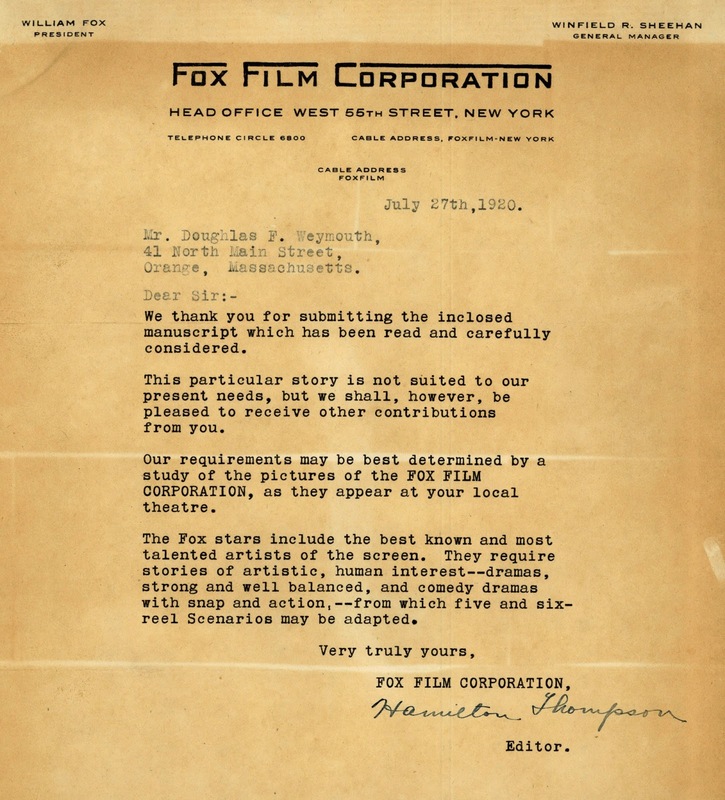 But there's nobility in trying, and that's as true today as when Vitagraph, Fox Film Corp, and Famous Players/Lasky sent out their polite "not for us, but thanks" to never-say-die Douglas Weymouth. 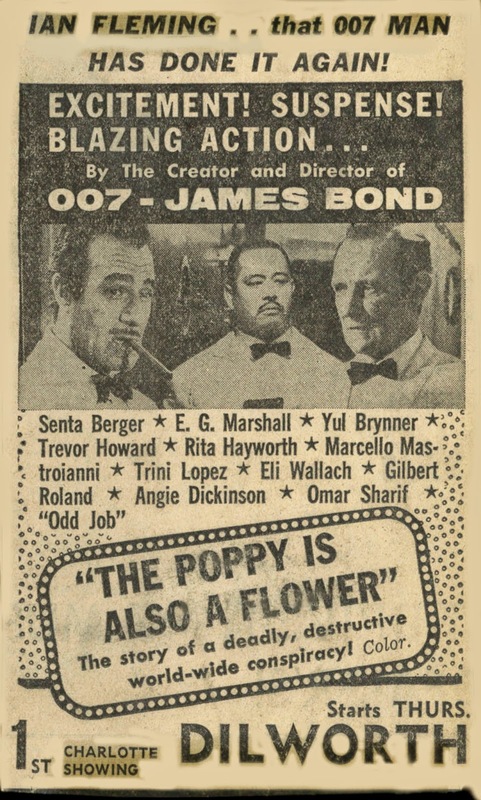 Will The Poppy Is Also A Flower (1966) Bloom Again? This ad in Charlotte's paper stopped me cold. Was this a new James Bond? The Poppy Is Also A Flower was first shown on television (4/66), then at theatres worldwide. It was produced under auspices of the United Nations, financed by the Xerox Corporation, plus monies from Euro distribs. Links to 007 were rife and heavily emphasized. Terence Young of three Bond-ventures would direct a story conceived by Ian Fleming. 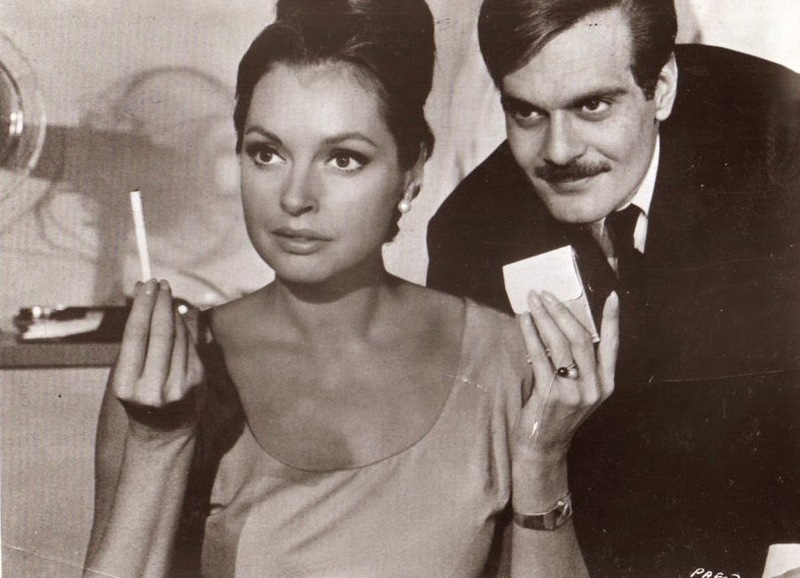 The cast was international and star-studded, all in for a single dollar, or English pound, Austrian shilling, whatever currency was dispensed in variety of countries where shooting took place. UN topper Adlai Stevenson helped grease wheels of cooperation and equated creative input to public service, thus a Yes from most names asked to participate. Proceeds were earmarked for UNICEF and other charities, so volunteers knew cash would head in useful direction. Director Young had choice of subject matter from UN files, and chose the opium scourge for his action base. From there, a modest venture grew to big-budget quest of Young to out-do Bond and have himself a sprawling and international hit. Production took nine months at a cost of $1.8 million. 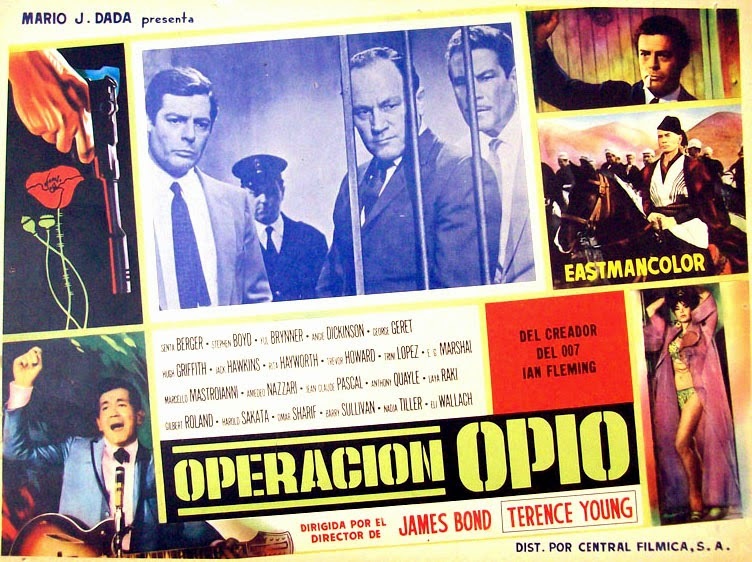 Young had worked closely with author Fleming to incorporate "all the James Bondesque elements imaginable." Filming took place all over the continent, much of hospitality via the Shah Of Iran, who put desert locations and his nation's army at disposal of Young's crew. Iranian effort to quell drug trade was lauded by Princess Grace of Monaco, who spent two days filming a prologue for the feature. Distribution got cinched for all territories excepting the US (MGM, for instance, handling UK dates). Stateside majors balked due to Poppy's tube-premiering, that set in stone for 4/22 no matter epic size of the completed pic. Young was told to trim The Poppy Is Also A Flower to 80 minutes for fit into hour-and-half slot ABC skedded. That meant twenty minutes shaved off 100 that was Poppy's full length, these including "adult" content Young inserted for worldwide lure. Some of wallop recalled highlights from James Bonds previous. 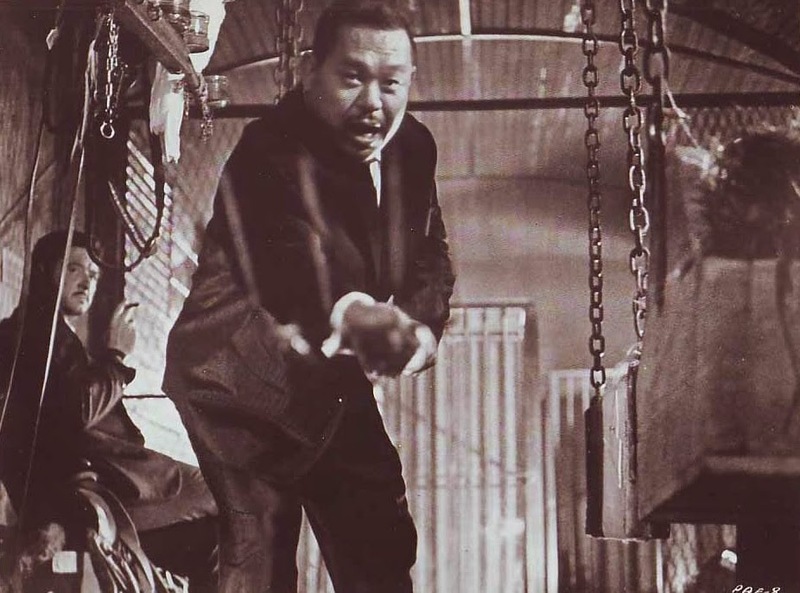 There were bikini-clad girl wrestlers to evoke the gypsy fight in From Russia With Love, and the rail-set combat to death between 007 and assassin "Grant" (Robert Shaw) from the same film was redone here with UN investigator E.G. Marshall opposing drug minion Anthony Quayle. Variety reviewed The Poppy Is Also A Flower in its TV version and sang praise, called it "drama ... loaded with suspense, action, and excitement." Tube broadcast notwithstanding, there was a "World Premiere" in Vienna (5/7/66) at "the biggest cinema in Europe," seating 3,000 at what ordinarily was host to sport events and ice extravaganzas. Government officials and Poppy stars were there in force as the film teed off successful runs across the continent. What remained was theatrical release for The Poppy Is Also A Flower in America, but who'd distribute after ABC and sponsoring Xerox gave the show away? A new company, Comet Films, picked up The Poppy Is Also A Flower among twenty features they'd have in US circulation for fall/winter 1966. 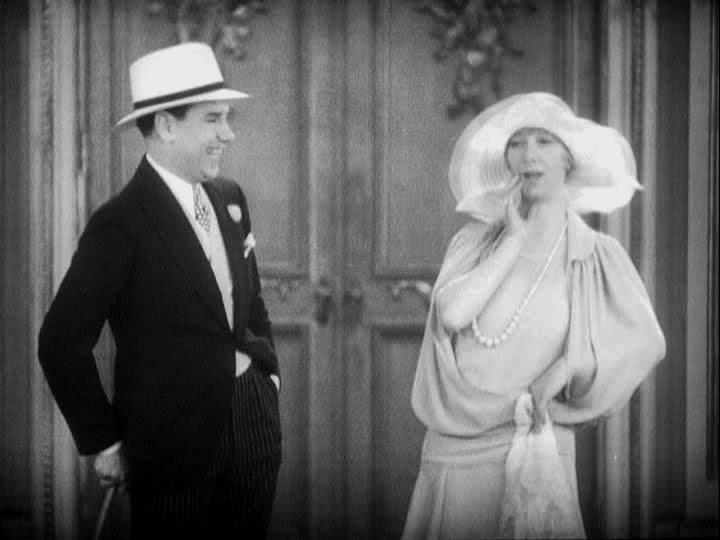 Poppy, of course, was the jewel, but Comet couldn't swing initial bookings for New York, Chicago, or Los Angeles, each turndown based on TV having first sniffed the Flower. Comet settled for a Texas opening, then to whatever keys they could interest. All would pound the James Bond links, Thunderball having been a biggest of all 007's and still playing to full houses. Comet made hay too of fact that theirs was a complete and unexpurgated version of The Poppy Is Also A Flower, unlike ABC's sanitized run. Expectations ran high, Comet headed into the marketplace with 200 prints (an "unusually large number ... for an indie," said Variety), execs figuring on two million at least in domestic rental. They'd adjust that later ("perhaps over-optimistic" said Comet staff), one million being the more realistic estimate. As of June 1967, however, Comet was still trying to rinse off the stain of Poppy having run first on television, and theatres' ongoing reluctance to book it as result. Poppy barely sprouts on DVD, or streaming, let alone Blu-Ray. An indie label offers it as The Opium Connection, but reviews say picture/sound "leaves much to be desired." There's a disc from Region Two that smacks of buyer beware. You can watch The Poppy Is Also A Flower on You Tube, but that isn't the experience Terence Young aimed for. Maybe it's foolish optimism, but I've a feeling Poppy would flourish on properly restored and widescreen HD, but who the deuce "owns" it? Maybe I should drop by UN headquarters like Roger Thornhill and ask how much for rights to The Poppy Is Also A Flower. Wish someone would, because it's a fun ride over 60's "International" landscape. The cast is glittery, with action profuse, if not on level with 007. I'd have liked Poppy a lot more in 1966 than Matt Helm, Flint, or U.N.C.L.E paste-ups, but who would drive me ninety miles to the Dilworth in Charlotte? Fun's a-plenty, even on You Tube. Stephen Boyd looks to crack the cartel in a first reel, but is casually killed off so a next star can shine. 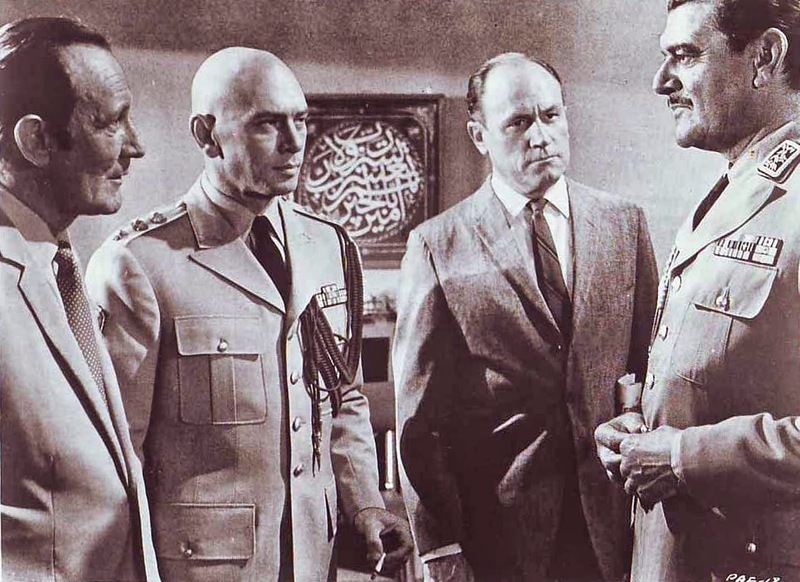 That's Yul Brynner, and later Jack Hawkins, as uniforms behind UN force. 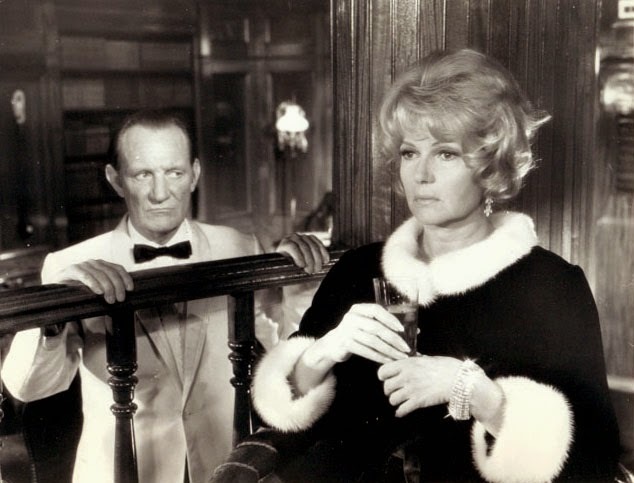 Going undercover are Trevor Howard and E.G. Marshall, theirs an early incarnation of "buddy cops" later decades would popularize. Scheme is to make opium radioactive so shipments will trace easier. 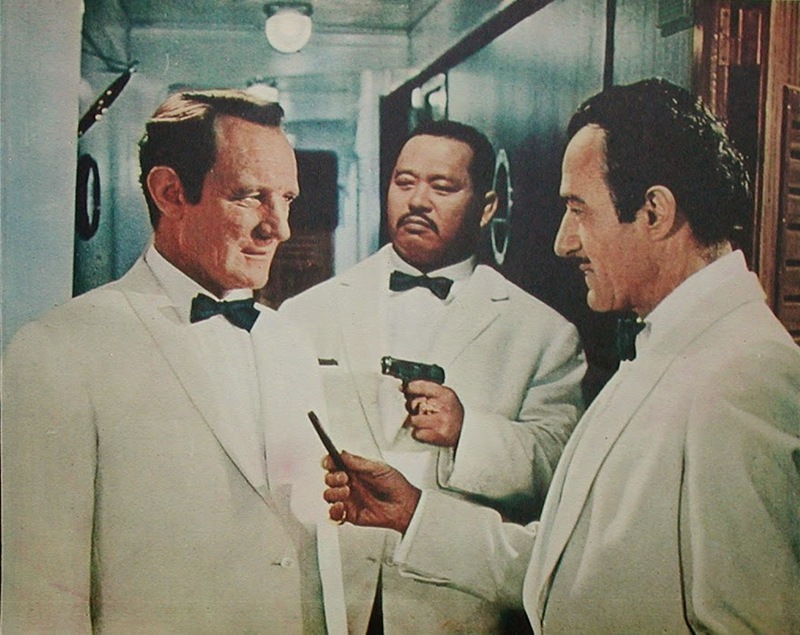 Eli Wallach pops in as a dealer who fronts in aspirin and toothpaste sales, while lead heavy is Gilbert Roland, his muscle assist Harold Sakata in Oddjob guise. Briefly-in Rita Hayworth carries heroin in her purse. T. Howard notes grimly that there are "60,000 addicts in New York alone" (so few?). He cites as well "the law of the Mafia" that results in prison strangulation of a would-be informer. There would seem no reason for Trini Lopez to appear and sing Lemon Tree, yet there he is. Such is the wide, weird, world of The Poppy Is Also A Flower, a relic rare and likely to remain so until someone (anyone!) comes to belated rescue and makes it generally available again. Love Contest In RKO Penal Colony! 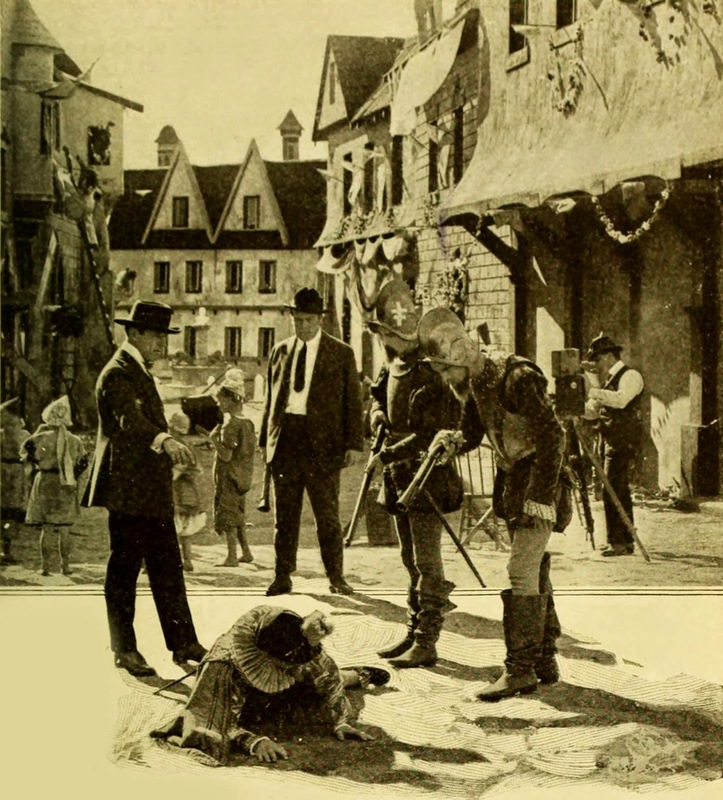 Director Tay Garnett turned loose his camera for RKO-Pathe and the thing fairly leaps about sets and location for this melodrama set at a French penal, read Hellhole, colony. Ann Harding foolishly goes there to join dissipated and near-gone-mad Melvyn Douglas, dashing/dutiful when he left, but gone to drink and unchivalrous manner after a year's duty. 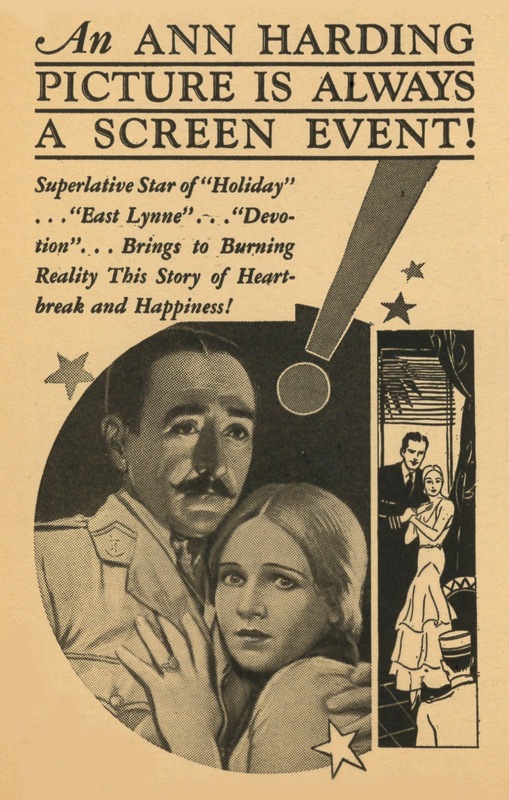 Will she stay loyal or yield to romantic blandishment of rival Adolphe Menjou? It may not matter for as many as 71 minutes, but Garnett's flamboyant direction makes Prestige noteworthy, being a virtuoso display of how talent could take commonplace content and get real visual excitement out of it. Our POV never stays still; when characters go on the move, we follow. I don't know another '32 release so adventurous. Pete Harrison, of Harrison's Reports, said Garnett's "shifting camera" was headache-inducing and a menace to calm viewing, but modernists agree this director has more due coming. Tay gave Prestige the razz in his memoir, calling it "highly forgettable." My guess is Garnett hadn't seen the thing since it was new, maybe not even then. 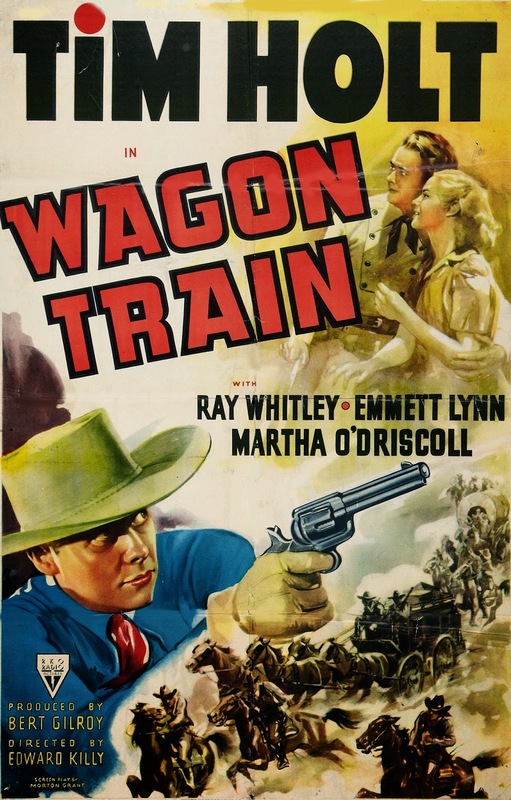 TCM runs Prestige occasionally, and it's bound to show up soon at Warner Archives. 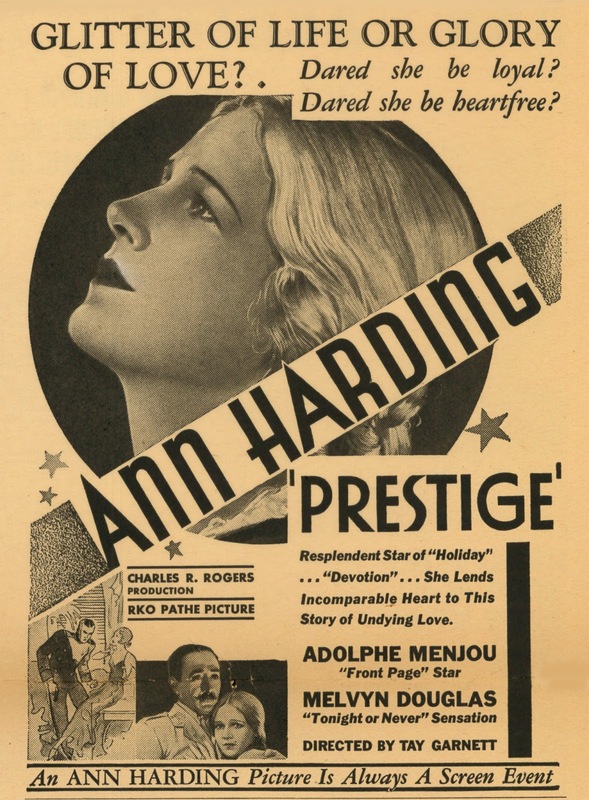 And see this previous Greenbriar post about star Ann Harding and her home theatre ... circa 1934. 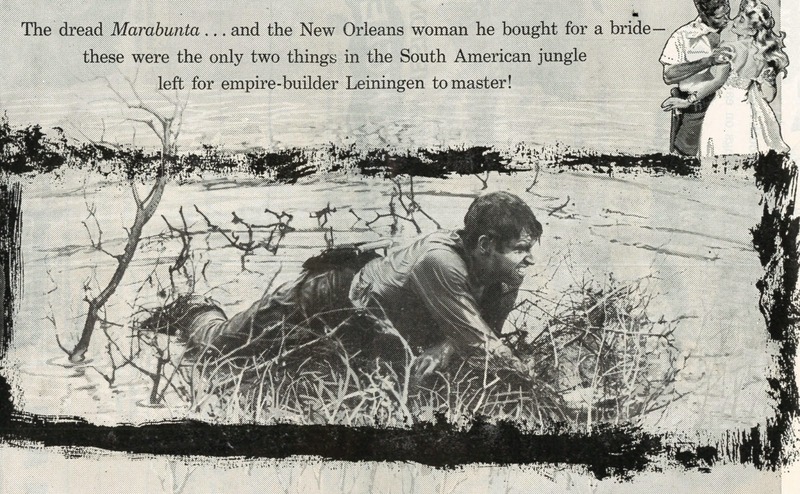 Soldier ants by billions devouring anyone/everything in their path looked like my kind of Wednesday network movie when NBC premiered The Naked Jungle on 2/10/65, trouble being a school night and bedtime looming before insects began their march. Jungle held promise not dissimilar from Warners' gi-ants of Them! (also 1954), except Paramount took longer paying off on scary set-up. What I recall best of the broadcast was pleas made at each commercial break to let me stay up just a few minutes more for the big attack that just had to come before a next sponsor message. That first hour was agony, what with a music stinger at each mention of "Marabunta," native term for the oncoming horror, plus corpses floating down river stripped of flesh. Yes, The Naked Jungle fell very much into chiller category for all of us starved for shocks in primetime, but it would be years before I'd see those ants spoil Chuck Heston's picnic. 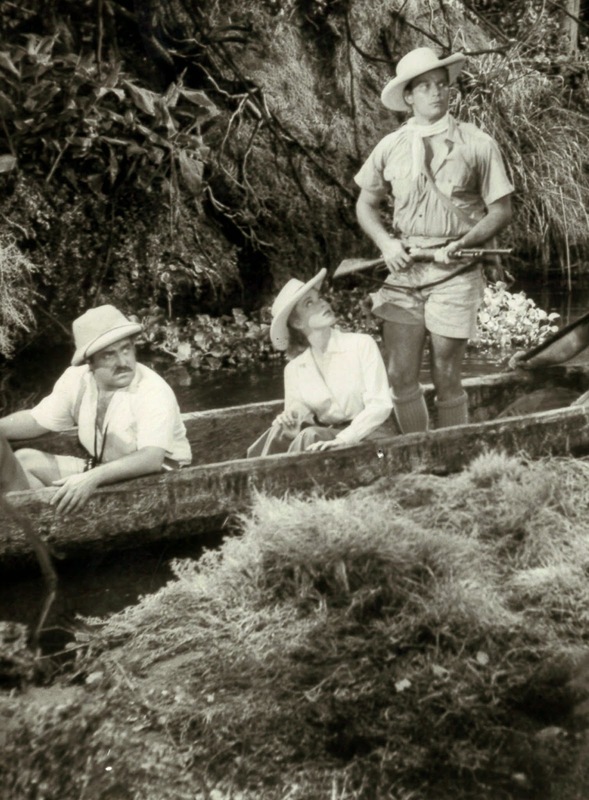 George Pal produced The Naked Jungle for biggest outlay ($1.5 million) so far of his Paramount projects, Jungle a first he'd do with major stars. It returned two million in domestic rentals, had a post-Ben-Hur reissue (w/ Heston emphasis) to reward of $257K more, then near that much again when NBC wrote checks (twice run in '65). 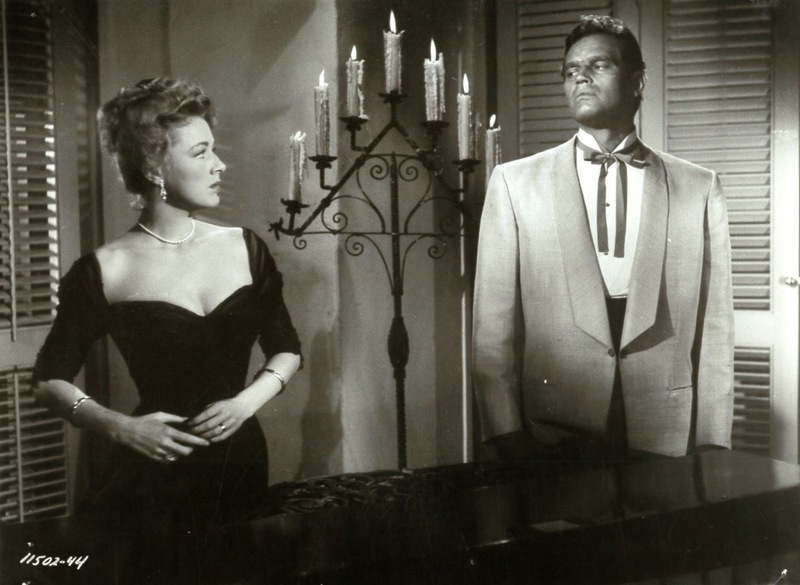 Director Byron Haskin gives amusing account of basis story/resulting script he thought was good, and how Para's front office botched it by shoe-horning Eleanor Parker in as leading lady. Seems she owed them a picture for money loaned her husband, Bert Friedlob, him the indie hustler who'd later give us While The City Sleeps and Beyond A Reasonable Doubt. Haskin figured The Naked Jungle for crab grass after that and so went through paces of yet another studio plod. Charlton Heston thought better of the outcome and said so in his memoir. Neither imagined impact The Naked Jungle would have on a generation of boys for whom killer ants was greatest gift movies could give. 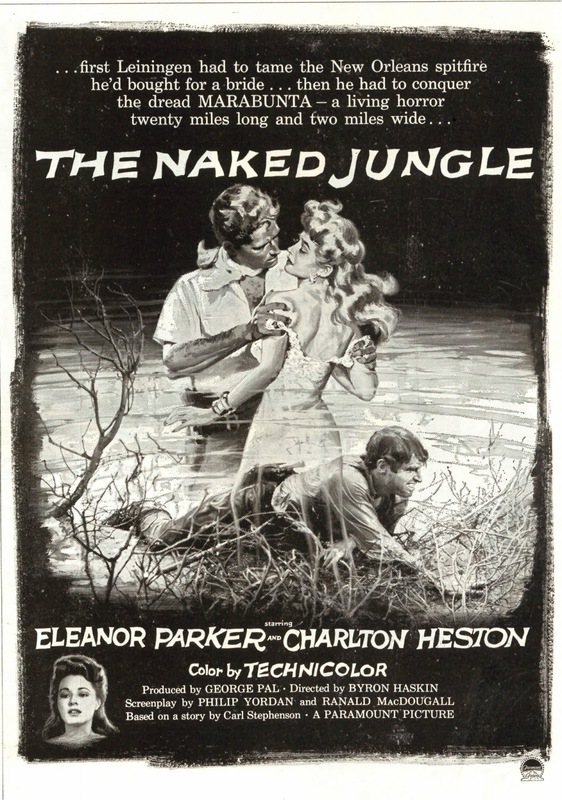 The Naked Jungle was set in South America, or rather the matte paintings were set in South America. Pre-Cinemascope 50's was still arena for charmed fakery of miniatures and painted glass or Masonite to evoke far-off places. Paramount did all this to nines thanks to fx crew lately off When Worlds Collide and War Of The Worlds, also for George Pal. New to Para's screen magic department was John P. Fulton, he of Universal horror background and a successor to recently deceased Gordon Jennings. The "Marabunta" make a frightful noise, which I suppose ants would if counted in millions and crawling all over you. Actually, I looked up that word after reading Byron Haskin's claim that he dreamed it up ("I coined the word myself") --- Marabunta is defined as "any of several social wasps" or worse, a wasp "with a mean sting." As for the term applied to army ants, Wikipedia suggests it, but I wonder if that and other contemporary references aren't result of The Naked Jungle and impact it had. The Naked Jungle streams currently on Amazon Plus in HD, looks fine, but is full-frame where it should be 1.85. 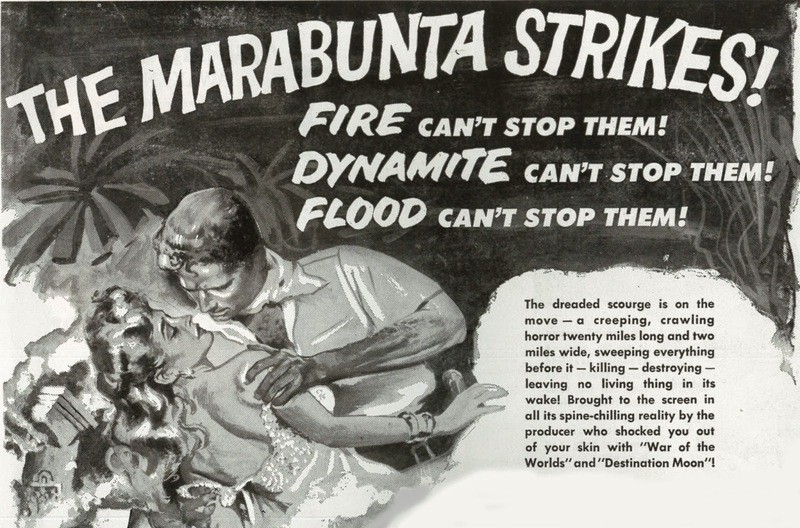 Guess Paramount will do the fix and deliver The Naked Jungle on Blu-Ray about the time Marabunta show up at my door. 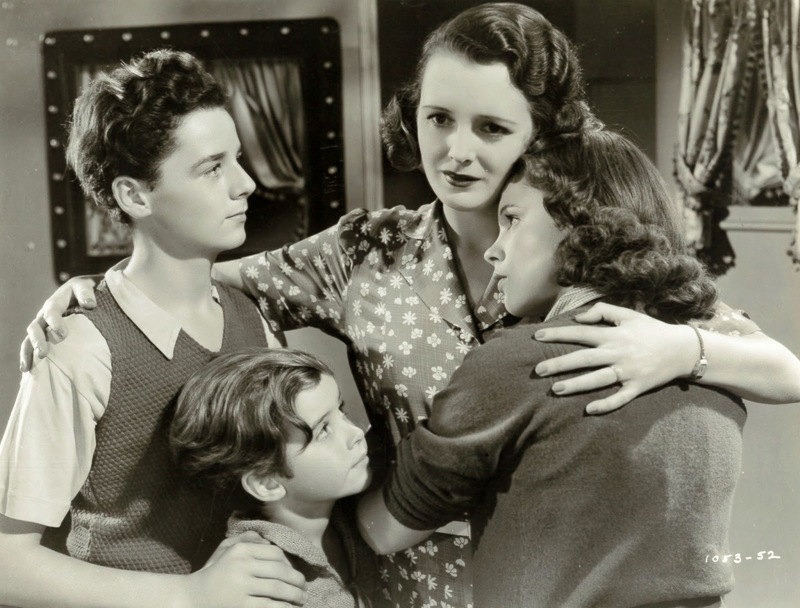 Judy Garland and Freddie Bartholomew want to rescue widowed mom Mary Astor from marriage to stolid banker Gene Lockhart. Can handsome stranger Walter Pidgeon supply a way out? Garland was the incoming express at Metro as Bartholomew set upon departing rails. He'd got gangly at fourteen and maybe Metro figured him overpaid for diminished charm. There were lawsuits flying (custodian aunt vs. parents for the boy's income), and that could have put icing on resolve to let Freddie go. Not known is if Metro settled his contract, or FB left of own volition. Either way, he was tough casting at awkward age in a same way Roddy McDowall would be in the 40's. Proper English Boys seemed to appeal more than young men of a same bent, as Bartholomew and McDowall learned. They'd both find going tough in adolescence. Moppets at Metro could tip scale between precocious and plain bratty, little Scotty Beckett crossing such a line here. You wish someone, anyone, would lay on a hairbrush to put him straight. 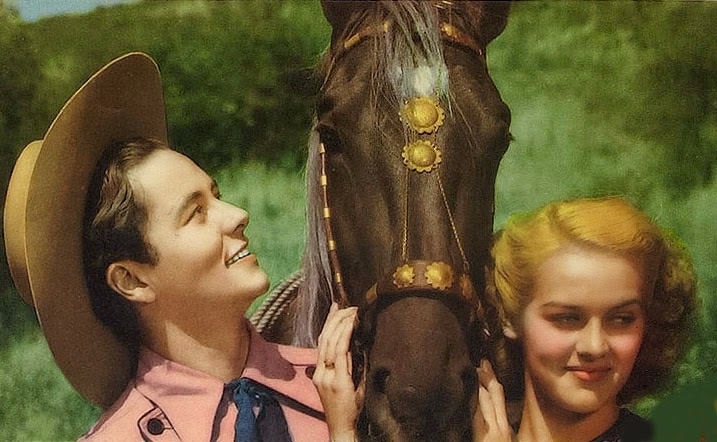 It's clear from a start, in both feature and trailer, that Listen, Darling (tendered by its preview as a "Sunshine Special") will be Garland's vehicle. She gets the tunes and heart-tug to which others react or sing along. An early hazard for JG was inclination toward tears, less her own habit than cliché on part of writing. 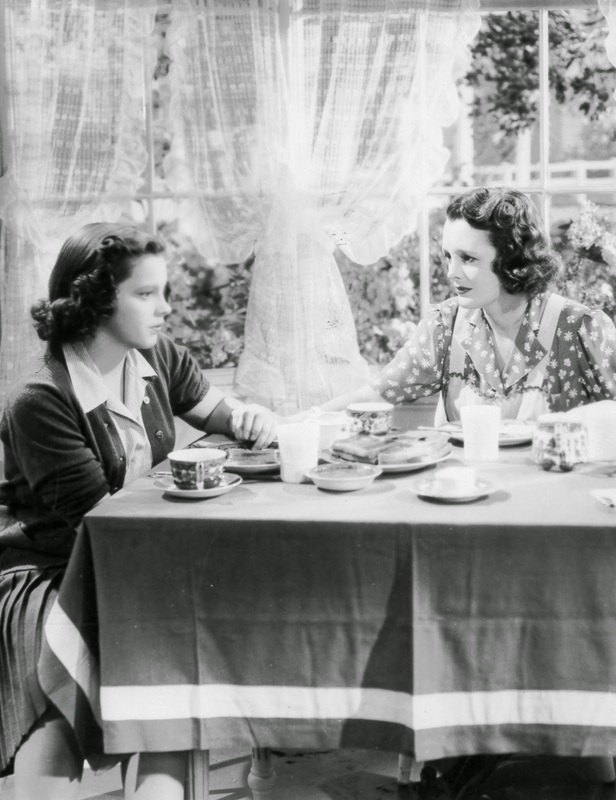 Not such a go-getter as faster-rising Deanna Durbin, Judy's cue to cry came with seemingly every reel change through Listen, Darling. Yes, this actress had unique gift of sincerity, but handlers abused it and our patience by over-reliance on her sad mechanism. They seemed to be working off a list called "Things Garland Does Well," at top of which was "Weep." The voice came to rescue of this in Listen, Darling. Judy sings thrice, one instance of which, Zing Went The Strings Of My Heart, became a standard for her. 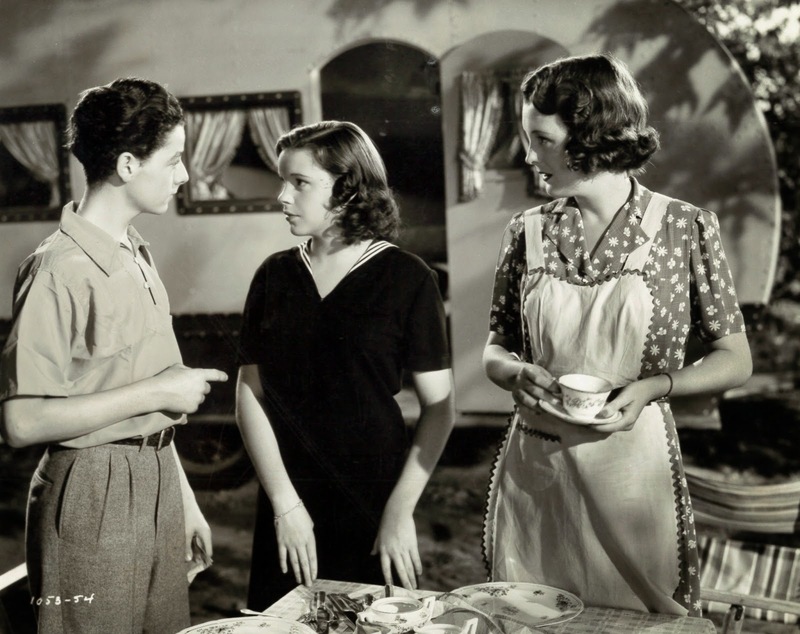 There's also upbeat On The Bumpy Road Of Love, performed by the cast as they travel over rough public byways that were reality of 1938 and years to come, and pulling a trailer besides. Such road condition might be cause for any of us to cry, or be considerably discouraged, if faced with today. Success of Andy Hardy made child-centering a brand for MGM, question being if youngsters could cope with a same killing pace as borne by adult players. Garland famously could not, and there was walking wounded among others who told their stories later on. Bartholomew wound up "without a penny," family squabble having eaten up all his $ in legal fees. Tank town thesping, like a late 40's (and aborted) turn in Greenbriar's own backwood, was fate of Freddie as he tried for a grown-up career before settling behind-scenes in TV. Pictures like Listen, Darling were less end in themselves than investment in future stardom of youngsters being developed. 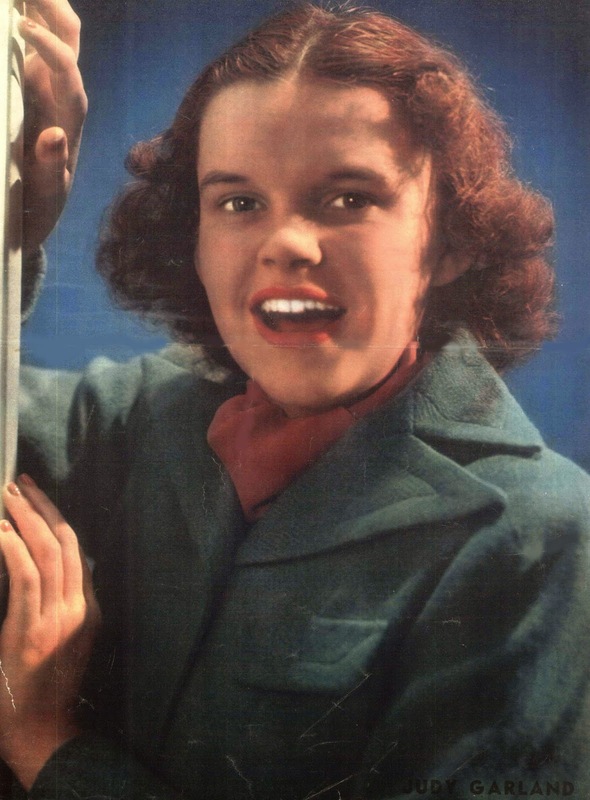 Maybe then it was OK to overspend on the negative ($566K), and stand a final loss of $206K if that would bring Judy Garland to a wider public's attention. 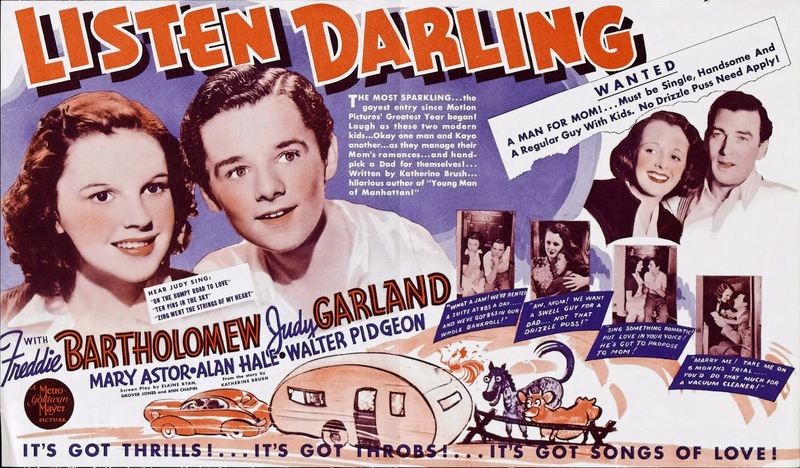 Variety called Listen, Darling "a lightweight offering that will sneak through on the lower sections of double bills," but this was no "B" in terms other than length (a brief 75 minutes), producer Jack Cummings having lately done decided specials Born To Dance and Broadway Melody Of 1938. 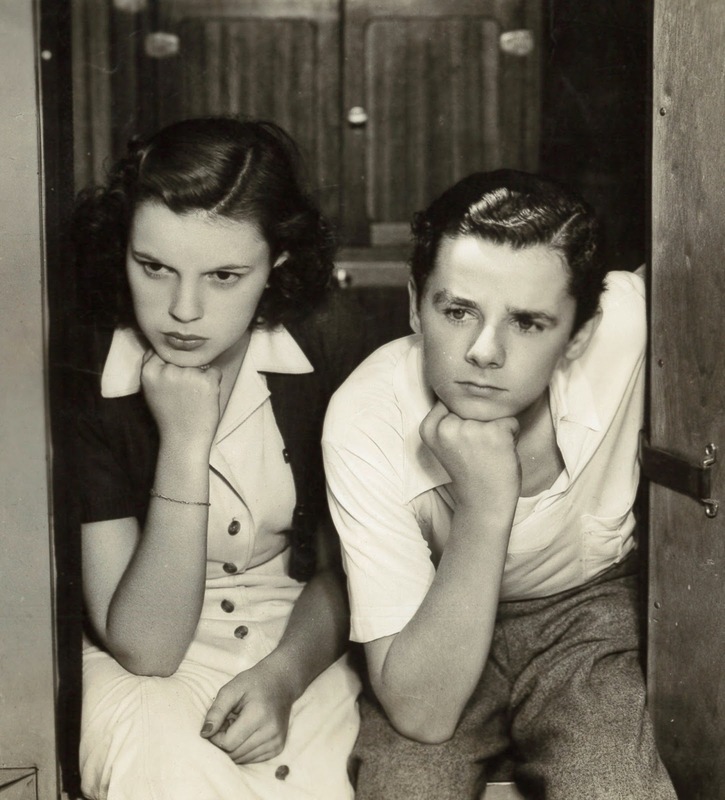 Next-up for Judy Garland was The Wizard Of Oz and a greater gamble, plus further loss, but when profits came, via 1939's Babes In Arms, it was a deluge ($1.5 million). From there, she was reliable as rain for steady gain. Joseph E. Howard looked like a tired old banker who happened to write hit songs. 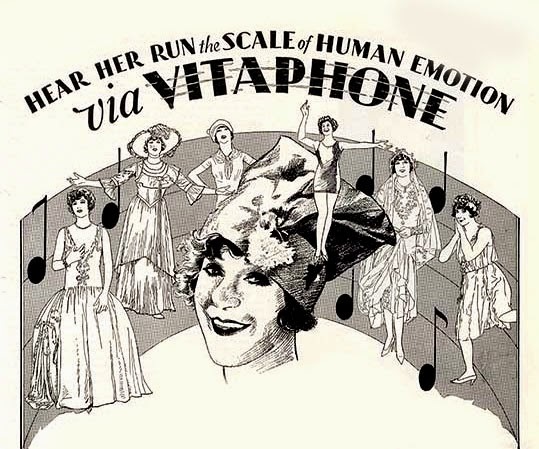 For purpose of this Vitaphone single-reel, he sings a handful in offhand and "Remember This One?" manner, ingratiating for the brief time it lasts, and worthwhile as record of a composer flexing his wares. Howard makes it seem easy, as if any of us might jot off a tune or three before breakfast. For such talent as his, that may have been the simple case. Howard did contribute a number of standards, or at least they were then, some remaining so for so long as he lived, enabling the tunesmith to take memories on the road all the way up to his own departure in 1961. At least he stayed long enough to enjoy 20th Fox's no-doubt fictionalized account of a straightforward music life, I Wonder Who's Kissing Her Now, in which staid Howard was impersonated by dashing Mark Stevens. There were appearances on Ed Sullivan into rock and roll's era --- what a culture meet of Gay 90's cleffing with hip-swivel successors. Howard must have felt he'd gone within a lifetime to a different planet altogether. 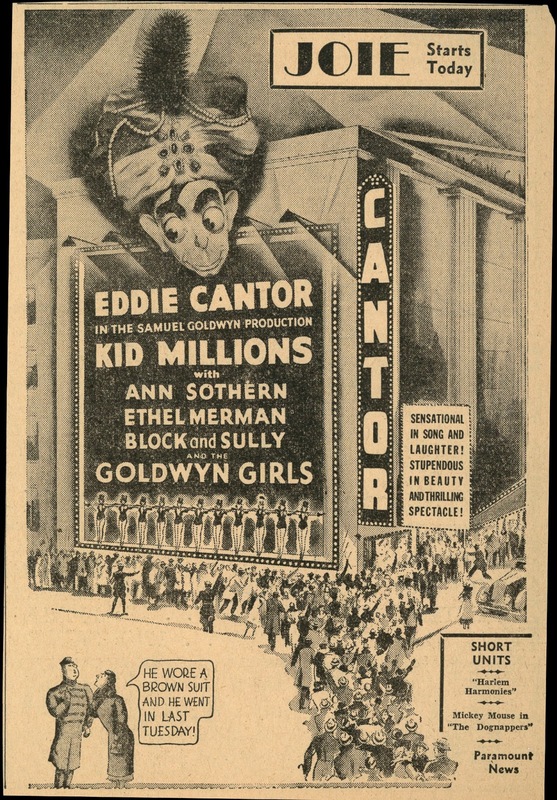 Goldwyn production values again threaten to swamp Eddie Cantor comedy in a 30's sampling of too much of a good thing. Cantor worked best when left to routines a stage could accommodate and didn't need chorines by dozens engulfing him. A guess game at Goldwyn was spotting future stars among leggy line-ups ... I'm told Lucille Ball is among those here. Our Gang personnel are used as virtual extras. Did feature folk not realize how valued these faces were to short comedy followers? 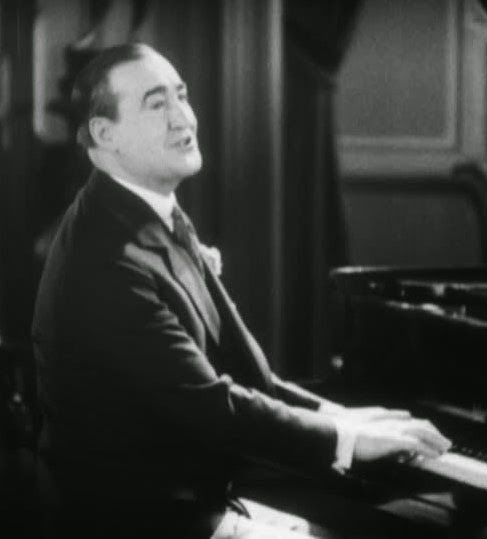 There's a big minstrel number, but by this time, no Busby Berkeley to supervise it (he'd left for Warners). The yarn decamps to Egypt and silly sheiks for Eddie to spar with. A habit of veering afield of Cantor in favor of dullish romance couples (here it's newcomers George Murphy and Ann Sothern) made ninety minutes seem longer. Salvation arrives in a three-color Technicolor ice cream truck --- an entire last reel with Eddie opening doors to confection's dreamland, arguably a tastiest use of the process ever. It's worth watching Kid's B/W lead-up on hot coals to collect visual reward of this. 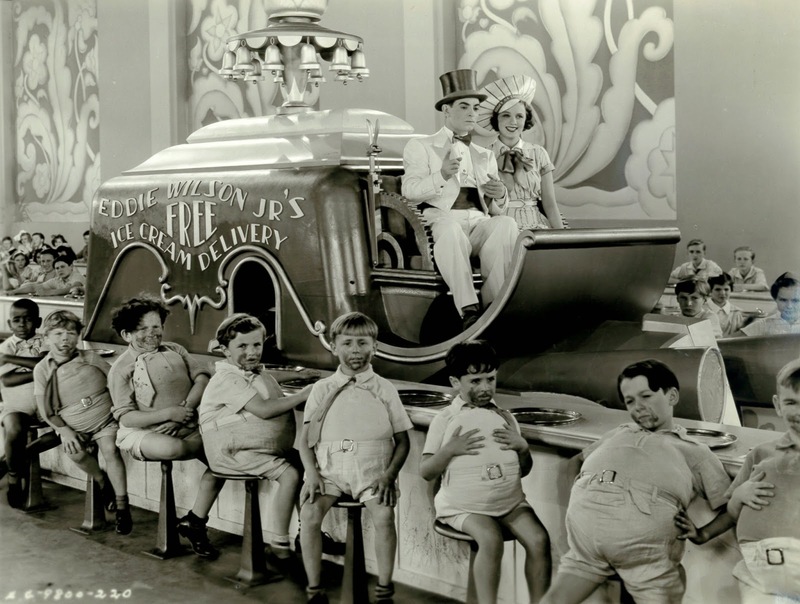 Warner Archive has Kid Millions and Whoopee! among offerings from its recent Goldwyn pact, these an obvious choice what with vintage color process in both. Came across a Babylonian tower of an 8mm Intolerance at the last Cinevent and wondered how collectors back in the day stood for ordeal that was threading those tiny reels (well over a dozen) to sit three+ hours before a gauzy image. But wait --- I ran such a print, Birth Of A Nation in fact, to a college audience in 1971, juggling plastic reels in darkness and praying each would come in right order. What hills we climbed in that analog, or belt/gear, era. Word to wise: Avoid three hour movies where reel change comes every ten minutes --- it's murder, I say. Show of hands please, for teenage or under collectors who bought D.W. Griffith epics on narrowest gauge from Blackhawk during the 60/70's. Here was what separated sissies from the strong. And what about price? Intolerance set us back $90.98/$103.98 for 8mm/Super 8 respectively in 1970 (the equivalent of $409.74 or $468.28 today). You can get the Blu-Ray for under $30. Who says old days were better? For Privilege Of Owning Intolerance on 8mm. Intolerance tends to be a duty sit even for most confirmed cineastes. Griffith himself would later admit it was "more depressing than hopeful." Three of four interlocked stories have downer ends, so to watch alone is no spur to sunny days. I say days because it takes me multiple ones to push through Intolerance. A last two views, one on laser disc 25 years back, and most recently the Blu-Ray, were spread over three/four sessions. So why lie across this track? For me, a reason is quality like nothing dreamt of before --- this Intolerance takes the long bridge from swamp that was older prints and gives best evidence of DWG as then-master of composition/action-staging, all of what he was lauded for then and we had to take largely on faith thanks to compromised presentations from 1916 to now. Are we in a Golden Age of film retrieval and rebirth? Weekly arrival of digital marvels like Intolerance say yes. 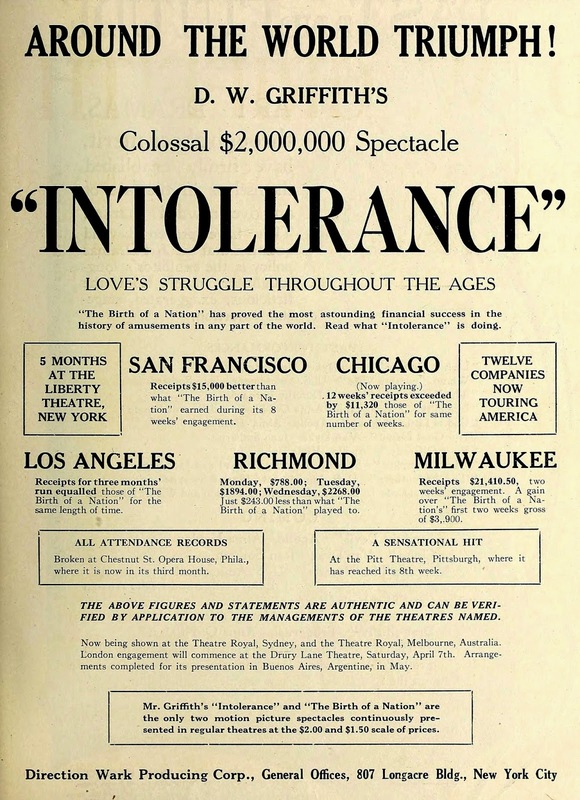 I'm for cutting cake on hundredth anniversary for Intolerance, since production did begin (on intended stand-alone feature The Mother and The Law) in 1914. What became Intolerance was actually cobbled from that venture plus a grand-scale Babylon saga Griffith dreamed up after flipping over Cabiria out of Italy. He didn't want Euros getting the better of him re bigness, and besides had Birth Of A Nation to live up to. 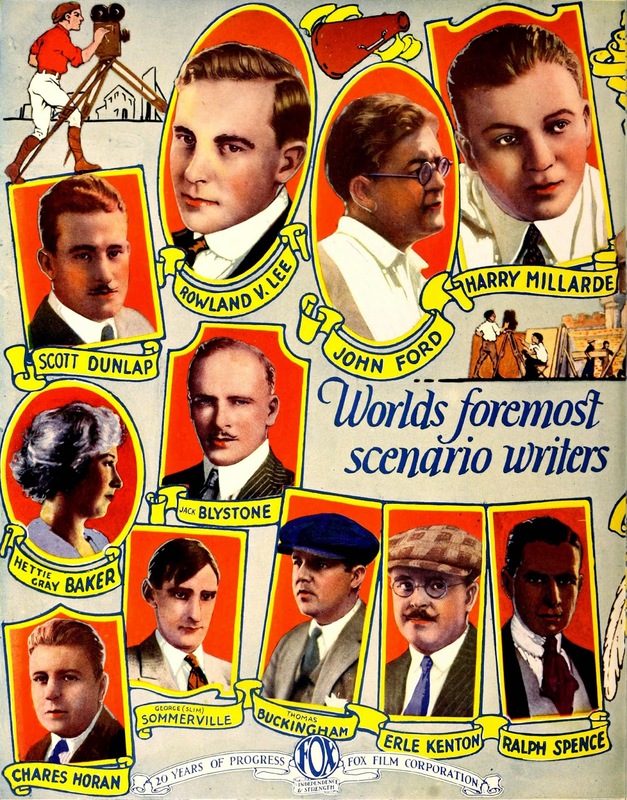 DWG felt a same rock in his shoe as David Selznick when Gone With The Wind became that producer's epic to surpass. Impossible missions for both, and respective careers suffered. Intolerance also bore brunt of critic division and a confused public. Was Griffith asking too much of moviegoers? Intolerance is a tough enough commission a hundred years out, and we're supposed to be so much more sophisticated than '16's lot. The traveling roadshow for Intolerance was like hauling those elephants DWG used to dress Babylon sets, 135 people needed to tie ribbon on hard-ticket play in key locales. Keeping them paid and covering house nuts left less cash in Griffith, let alone his distributor, tills. 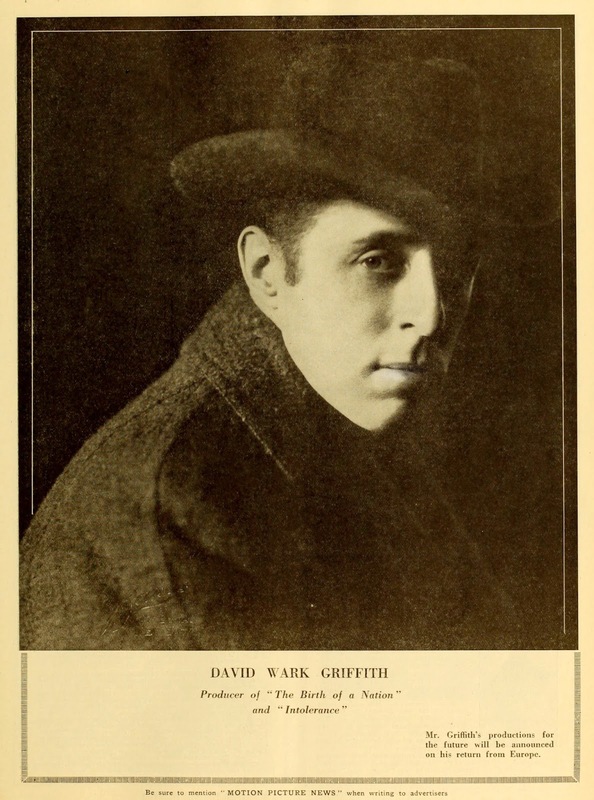 Griffith was the showman extraordinaire for all his openers. First-nighting to Intolerance would have been like going to the circus or a rock concert today. People surely came out of shows wrung out, what with all of live stuff plus emotional head-bang of the film. Trouble was Griffith the perfectionist never being satisfied w/work he'd done. In his parlance, there was no such thing as a finished movie. He'd rejigger roadshows from city to city, physical prints recut, scenes rearranged, to suit DWG's mood of the moment. Someone ought to do a book on Griffith the premiere impresario. He sure oversaw enough of them during career prime. 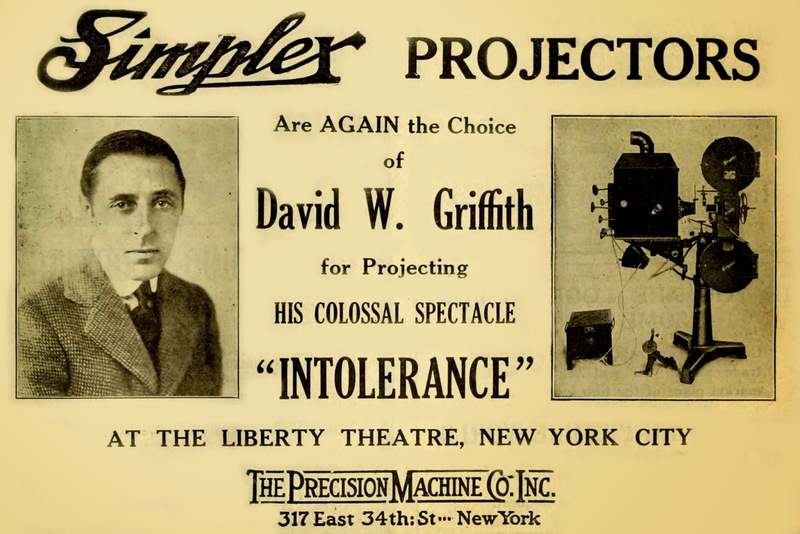 Amusing too are tales of Dave pushing way into MOMA projection booths as late as 1940, wanting to tweak Intolerance. He just wouldn't stop figuring ways to enhance the thing. What survives of Intolerance is best-ever presented on Blu-Ray from the Cohen Film Collection (and includes The Mother and The Law, plus The Fall Of Babylon, each released post-Intolerance). 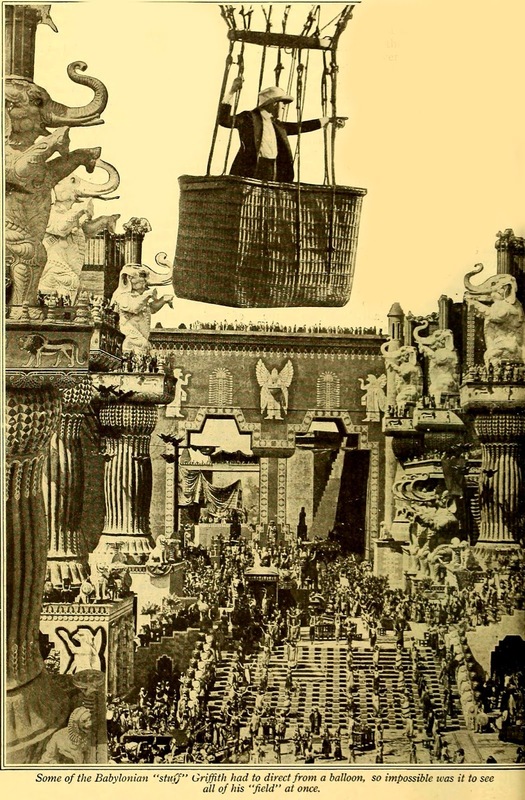 There is also an excellent book, D.W. Griffith's Intolerance: Its Genesis and Its Vision, by William M. Drew. 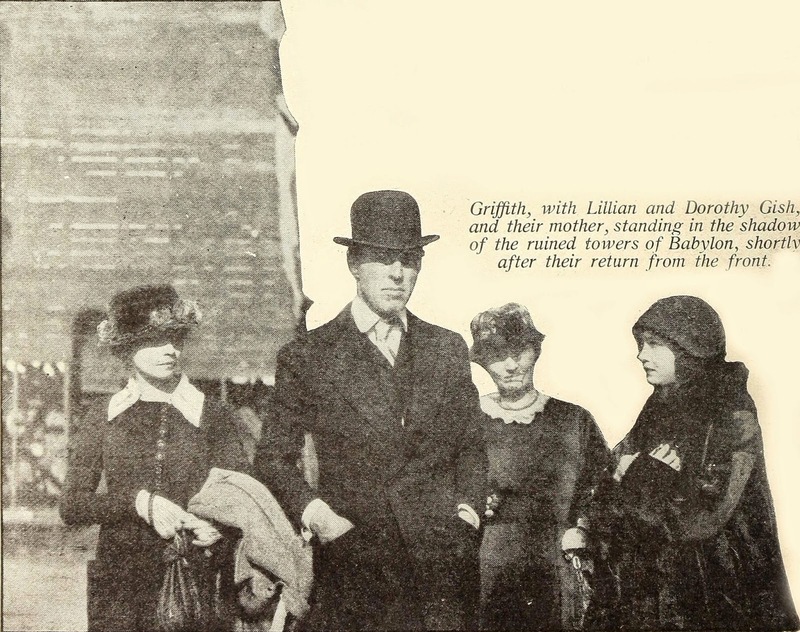 The author's webpage has lately added data re newly discovered previews Griffith held for Intolerance in summer 1916. Seems all previous histories were misinformed as to when the film was first seen by an audience. Drew sets that record straight in expert and thoroughly researched fashion. It wasn't anyone's easiest job to fit the Dead End Kids into B pics as follow-up to dynamic screen debut in Goldwyn's Dead End and even better Angels With Dirty Faces from WB. Surrender to comedy was years away; these initial seven with the gang (or is it eight?) never could settle on formula that might have sustained a series at Burbank. If Warners could keep Torchy Blane going, why not Dead Enders? The boys had come west armed with experience (from the stage Dead End) and no small ability, but how many helpings could a public take of street badness reformed? The place to go was lower-case B's, that purpose served by Universal, and later, Monogram. 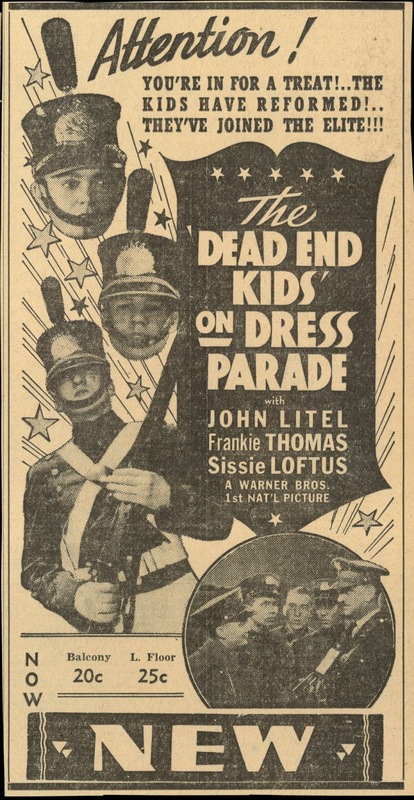 In the meantime, there was The Dead End Kids 'On Dress Parade' plus further Warner usage of the boys. 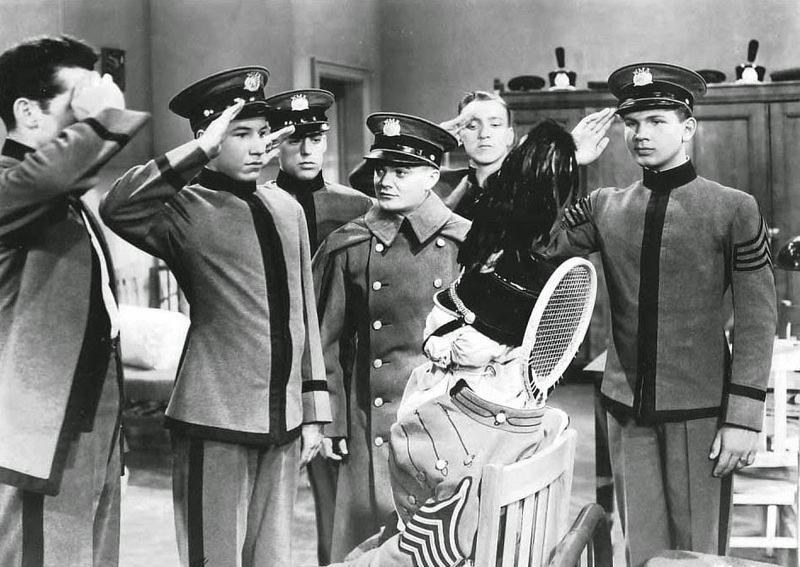 Leo Gorcey's "Slip" is the malcontent, others of his group eager to please brass at a military academy shaping youth for what's clearly a war to come (WB getting preparedness ducks in a row). This (small) Parade is basest off-the-rack, but there's comfort in that, and how many options were there in a military school setting? 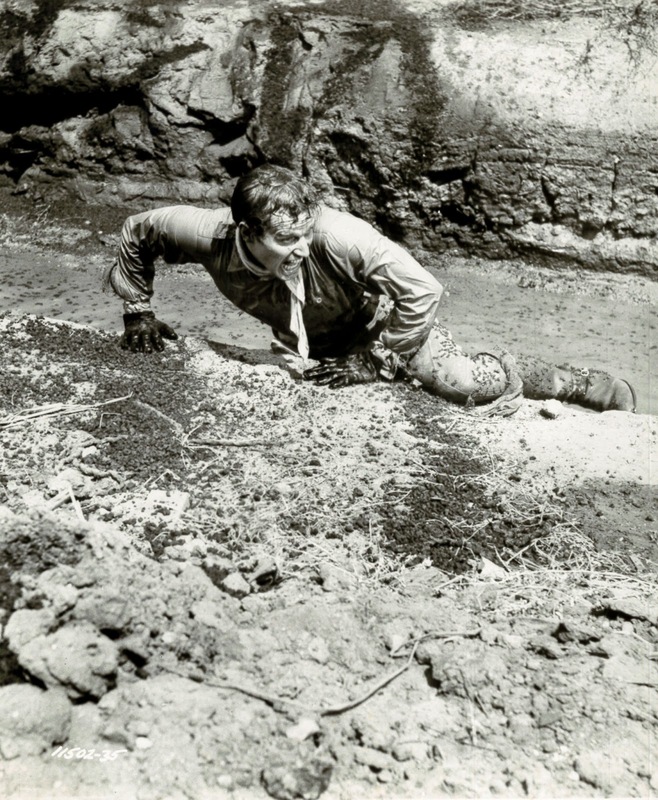 (Jackie Cooper and Freddie Barthlomew saw as narrow opportunities in same-year's Spirit Of Culver for Universal) Slip has to be put straight, and there's 62 minutes in which to do it. Campus exteriors were shot right on the Warner lot. I expected to see Hal Wallis or Bennie Foy emerge out a door for commissary lunch. There's strain on credulity for Gorcey leading the class in tactics and calculus, partial reason perhaps why WB gave up on the group after Dress Parade. William Clemens directed, a start Monday, finish Friday man ideally suited to budget work. Warner Archive offers The Dead End Kids 'On Dress Parade' in a two-fer with Hell's Kitchen, what I call a bargain.